Chinese New Year sale: 17.99$ after code “7ONQVEW4” on “amazon”:https://www.amazon.com/dp/B076YDYTS5. It might take a few hours, sorry. The code didn’t work for me. Is it the new version currently selling on Amazon? If not, where do I buy the new version? Tried using the new code, but it didn’t work for me. I bought two with the last Amazon code, but had to send one back. I would like to buy another to replace it, and probably one or two more. I’m also interested in buying some of the upgraded pill assemblies to upgrade them. Do they come with the emitter too, or just the pill and driver? Thank you for the great offer on a sweet little light! So I just tried the new Amazon code, and it worked perfectly for two Mini’s. 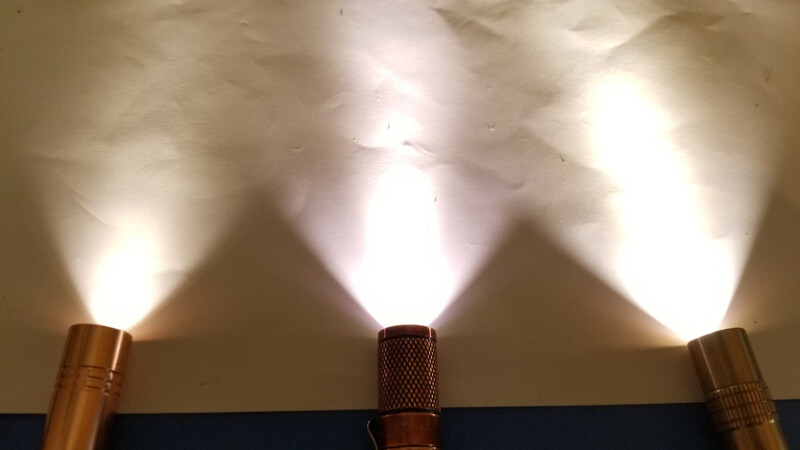 Thanks again for making such a great light, as well as the discount. Anyone know why the light flickers with a 10440 after a few seconds ? How about AAA battery? it might be the heat. Where can I pick up The brass pineapple? Question, sorry if I’ve missed this, I’ve looked through the whole thread. I hate to thread jack but I am curious for the brass pineapple as well. I received my mini, thanks! Beautiful light, Beautiful tint! 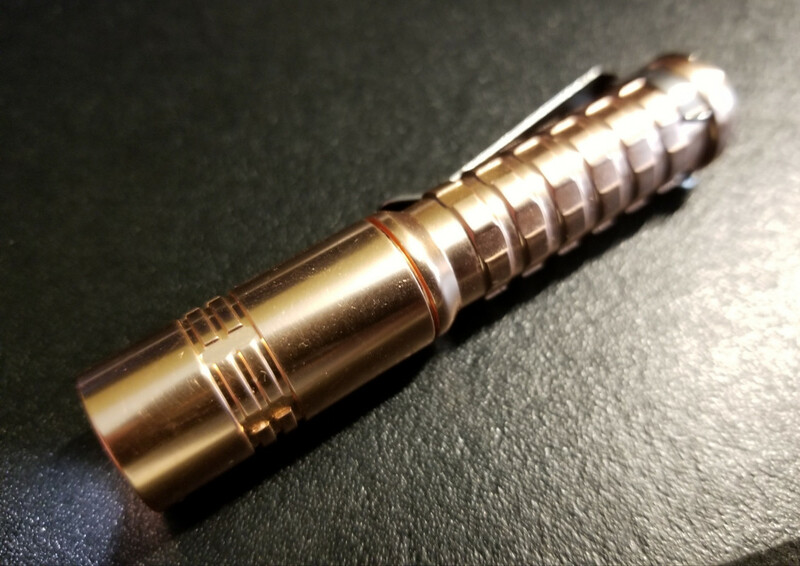 I bought 2 of these several months ago and they’re great, but they don’t seem to want to tarnish (olight i3e-cu I bought a couple of weeks ago is tarnishing beautifully). Is there a protective layer on the pineapple and if so, what’s the best way to remove it? Would be really interested in picking up an AA version in copper as well. Have the Maratac AA Rev 5 in Cu, but the pwm on low is pretty visible and it’s bumming me out more and more over time. The older version has the protecting coating, the new version has no coating & come in with vaccum wrapping. I can’t wait the nature patina form up! I bought two of these copper pineapples and think they are fantastic! Would love to get a brass AA. Please send info. Thanks! I also noticed no tarnish occurring so here is what I did. I disassembled the light using needle nose tweezers (very easy). You just unscrew the pill with the tweezers, pop out reflector and lens and remove o-ring from main body. Then I hit the whole thing with paint stripper and waited about five min. Wiped it down, rinsed and dried. Acetone or nail polish remover would probably work well too. Is this going to be restocked on Amazon? You can paypal and get it from me directly. Reminder for users of 10440 batteries - do not leave unattended!! Whilst I'm fully aware of the care required with high energy batteries, I was using the torch recently, on high with a 10440 IMR battery and the door bell rang; thinking it would be the postman and it would only take 20secs before I was back to my task, I put the torch in my pocket switched on (too lazy to twist it off) ...................................... when I sat down 5-10mins later, after examining the China Post goodies I just received, the torch stung my leg with heat and reminded me i'd forgotten all about it! Quickly removed the torch, which was no longer illuminated and dismantled to allow all to cool. Once cooled, I tried with several batteries without gain - upon dismantling I found the +ve wire to the LED had detached, presumably due to heat! Whilst incredibly fiddly I did manage to re-solder the wire and so far the torch is working fine on AAA NiMH & IMR, if I have damaged the driver at all it has yet to manifest. The battery labelling shows signs of cooking, but the despite the battery showing no signs otherwise of damage, I don't trust it any more. All in all an excellent, robust and useful torch that has survived user stupidity that I'm sure would have permanently killed other torches!